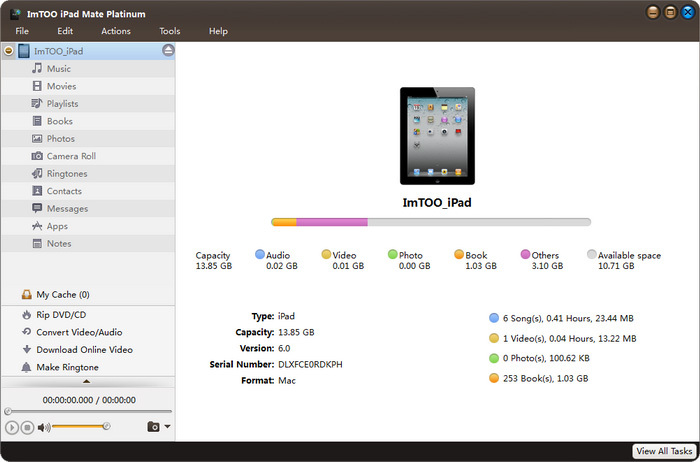 ImTOO iPad Mate Platinum can backup music/movies/photos/eBooks in iPad to computer or iTunes, transfer files from computer to iPad, convert DVD/CD to iPad music and movies, download and convert online videos to iPad, produce iPhone ringtones. 1.Transfer music, videos, photos, playlists and eBooks in iPad/iPod/iPhone to PC quickly and efficiently. 4.Download online videos and convert to the formats compatible with iPad/iPod/iPhone and transfer to the devices instantly. 5.Make personalized iPhone ringtones from audio and video files and move to iPhone at once. 6.Fully support output files for iPad, iPod Nano, iPod Nano 5G, iPod Nano 7, iPod Classic, iPod Touch, iPod Touch 5, iPod Shuffle, original iPhone, iPhone 3GS, iPhone 4, iPhone 5,iPhone 5 s,iPhone 5 c etc. 7.NVIDIA GPU acceleration is enabled to accelerate the processing speed. 8.Support logon on the most popular online video websites, including YouTube, Metacafe, Dailymotion, Break, Vimeo, Revver, Blip, Vidilife and Stickam to watch, download and convert online videos to the devices directly for enjoyment. 9.Create new photo albums and playlists or delete existing ones on iPod/iPhone/iPad easily. 10.Optimize the profiles when importing or converting multimedia files into devices. 11.Provides a convenient built-in player for preview DVD movies, photos or videos shot by the devices and export them willingly. 12.Simultaneously manage multiple devices without conflict by drag-and-drop to share your favorites with friends. 13.Proxy server configuration allows you to configure the network.